The 100% waterproof Cargo Saddlebag rests on the back of your vehicle, providing the easiest loading and access to your gear of any cargo carrier. 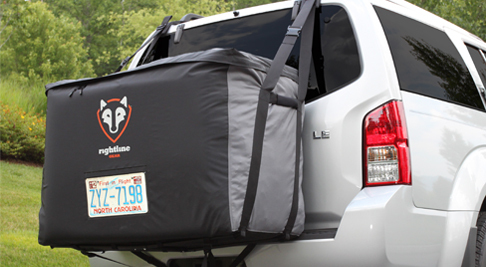 The Cargo Saddlebag is a unique vehicle car back carrier developed and patented by Rightline Gear (US Patent 7,475,799). It is designed to attach to SUVs, minivans, and crossovers WITH or WITHOUT a roof rack. Connect the Saddlebag’s side straps to a roof rack’s cross bars or side rails. On vehicles without a roof rack, add the Saddlebag Car Clips (sold separately) to attach the carrier to the gap between the vehicle's rear hatch door and roof. Located behind the vehicle, the Cargo Saddlebag is fully aerodynamic, saving you big money on gas (~5 mpg over car top carriers). It does not get hit with the wind, rain, and bugs like a conventional car top carrier. You may save enough in a couple trips to cover the entire purchase cost of the Cargo Saddlebag. Load the Cargo Saddlebag on the ground and lift it by its handles onto the back of the vehicle. The bag unzips 3/4 of the way around to make packing fast and to allow you to grab that one item you need once your trip is underway. The Saddlebag has a handle on each side so that it can be carried right off of the vehicle into your destination. 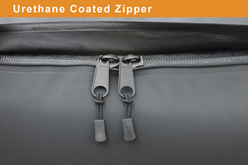 The Cargo Saddlebag has a urethane coated zipper under a hook-&-loop-close zipper flap to keep water out. 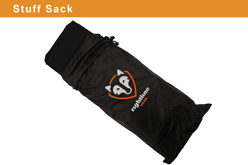 The cargo bag is constructed from PVC Mesh and Hydrotuff Material using our advanced Dual Seam Technology. 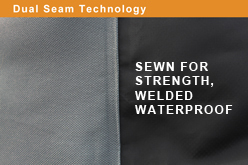 The two materials are sewn together for strength and then welded along the same line to make the seam waterproof. The end result is a 100% waterproof cargo bag that lets you travel with the confidence that everything will stay dry. The Cargo Saddlebag comes with a bottom pole frame that slides into guides on the underside of the carrier to provide structure and support. An interior access license plate sleeve is provided on the rear of the bag. 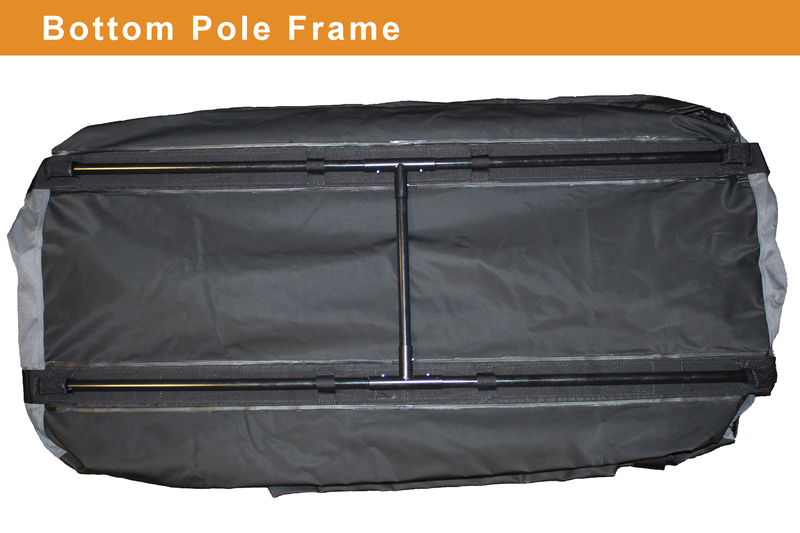 After your trip, the poles break down and the entire luggage carrier rolls up for storage in its own stuff sack. Use the luggage carrier on your next family vacation, backwoods expedition, shopping spree or move. The Cargo Saddlebag will be the best cargo bag you will ever use.